It can be difficult to express what we want, especially if we don’t know what we want. It seems to become even more challenging if we want other people to understand what we want. You can be the smartest person in the room but if you cannot transform your thoughts into a meaningful message, your team won’t understand what you are trying to say. They have to know where you are going, why you are going there and why they should come with you. One way to get started is to demonstrate behaviours that you would like to see. Write down 3 positive workplace behaviours that you would like to see. If you want to see more kindness, be kind. If you want to see people who show more initiative, show initiative. If you want to see people take on responsibility, you must take on responsibility. Start living and breathing your own expectations. If you observe these positive behaviours, acknowledge and reinforce them over and over again. By the way, the same strategy works with your co-workers, your children and your spouse. For the next 3 months look for the behaviours that you want to see instead of complaining about the lack of them. We have enough PCs (professional complainers) at the workplace. You don’t want to be one of them. You don’t need a title to be a leader. 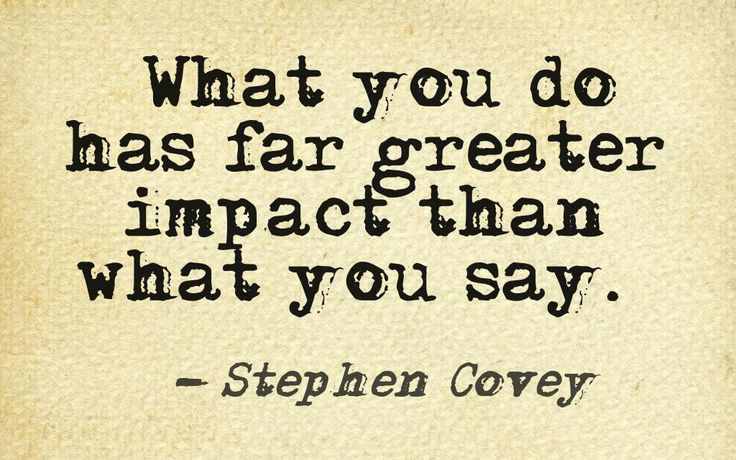 Lead with your actions, not with your words.